It’s amazing how many Earth cards I’ve been drawing lately. Usually I am sword girl. With no earth in my chart and Sun+Moon+Mercury in Gemini, I am used to spreads overloaded with Air cards. But since I’ve started getting ready for my surgery, a lot of that energy has shifted. I’ve consistently been pulling from the Disks suit in the Mary-El Tarot. And I am grateful because I feel how Spirit helps me to ground in my own body, offering me healing strategies and actual, physical support. 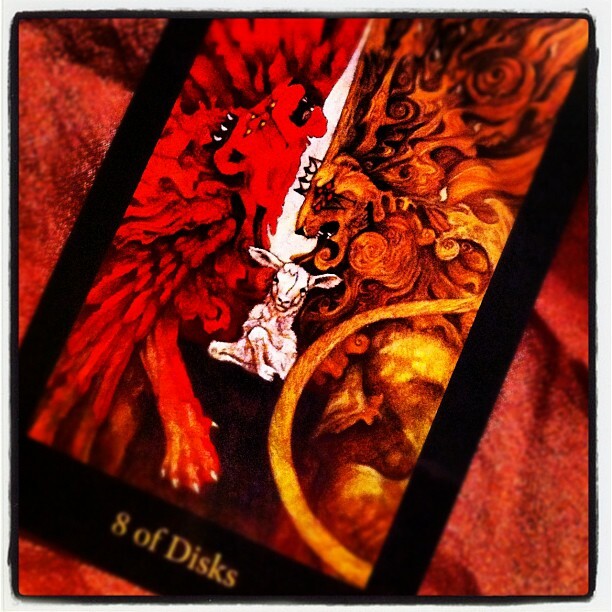 Today’s card is the 8 of Disks. When I look onto this card I feel a great sense of centering. 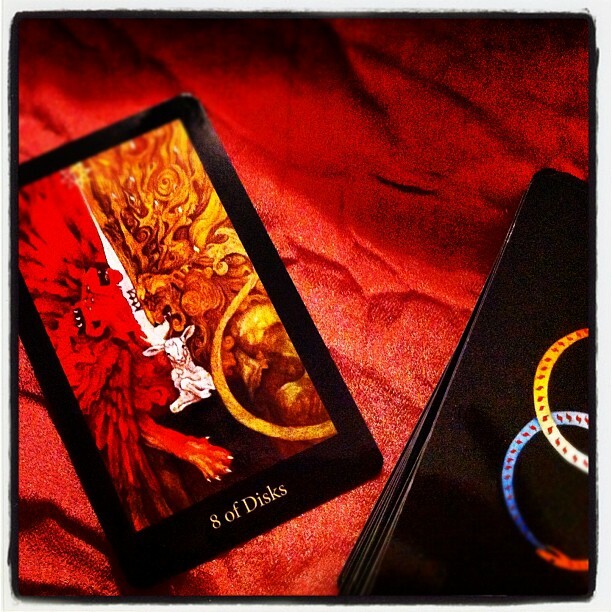 I am able to see the pain of my scars materializing in the form of the two majestic lions in the card. They stand for the burning pain of my past — the flames of my own karma and history. But the focus has shifted. My eyes are drawn to the calmness of the white color. It’s grounding and reassuring. The red and golden flames of the lions don’t scare me. I am past rage, and I am tired of anger. These lions actually allow some sort of protection. Seeing them and acknowledging my pain, physical and emotional, is an opportunity for release. Have my demons turned into gods? I’ve been to Ammut’s lake of flames, and I lived. Now I am learning to accept the internal glow of the Sun. To walk with Mercy grounded in my own being.